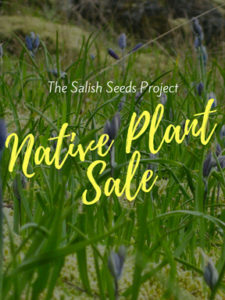 Come on out to the Salish Seeds Project nursery at Red Mill Farm, where you’ll find camas bulbs, wildflowers, Garry oak seedlings, and seed packets of other native plants for sale. Limited quantities on hand. Directions to The San Juan Preservation Trust’s Red Mill Farm Nursery: From Friday Harbor, take San Juan Valley Road for about two miles. Turn left (south) onto Valley Farms Road. Take the first driveway on the right at 1/4 mile. Parking will be near nursery, on left. Please call Tanja Williamson at 360-378-4402 or visit sjclandbank.org for more information.